Charles Sprague, the famous poet, was born in Boston on October 26, 1791, and died there on January 22 1875. His father, Samuel, born in Hingham, Massachusetts, was one of the party that threw the tea into Boston Harbor. Charles was educated at the Franklin School of Boston, and at the age of ten lost the use of his left eye by an accident. In 1804 he entered mercantile life, and in 1816 was taken into partnership by his employers. 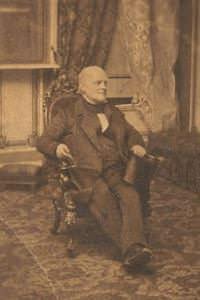 In 1820 he became a teller in the State Bank, and on the establishment of the Globe Bank in 1824 he was employed as cashier, serving there until 1865, when he retired from business. Mr. Sprague first attracted attention as a poet when he won a prize for the best prologue at the opening of the Park Theatre in New York. He achieved similar success at the opening of other theaters in Philadelphia, Salem, and Portsmouth. In 1823 he obtained the prize for the best ode to be recited at the exhibition in the Boston Theatre of a pageant in honor of Shakespeare, and in 1830 he pronounced an ode at the centennial celebration of the settlement of Boston. 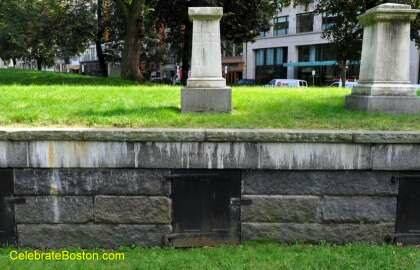 The Sprague family tomb is Number 5, and can be viewed from the walkway on Boston Common. The Boston Globe obituary is a nice tribute to Sprague.